I recently decided that I needed to do something about my abysmal knowledge of geography. For me, the best way to learn anything is to start a programming project about it so… I made a world map quiz website. The map data is the 1:50m sovereignty data set from Natural Earth Data. I did some cleanup in QGIS to remove unnecessary detail where it would not affect the look of the map. There’s still probably a lot of room for improvement here since the map data even after compression is several megabytes which is way too big. Click “Get a Hint” in the menu to be given the first letter of a country you are missing in the selected region. Click a country on the map to be given its first letter. Click again (up to 3 times) to receive another letter. You can switch between regions by clicking them at the top or switch to “World” where you are allowed to name countries from any region. Improved hints! Possibly a database of facts associated with countries. Other game modes: For example, country names are provided and you must locate them by clicking on the map. The source code can be found on GitHub. Let me know if you have any suggestions or encounter any bugs. When using log4j2 with a Servlet 3.0+ application, initialization and shutdown is supposed to be automatic. Unfortunately, if your application is still using its web.xml to define context listeners for other frameworks or libraries chances are good that you’ll run into thread leaks and other problems when undeploying your application or shutting down the application server (e.g. Tomcat). In this example destroy will be called on the Log4jListener and Log4j will finish shutting down before destroy is called on Listener 2 or 1. If either of those listeners try to use logging during their own shutdown this will trigger log4j to start up again and leak threads. Since this ordering is explicit in the spec, there is no way to properly use the log4j-web auto initialization feature if you still have context listeners that use logging in your web.xml. Set the isLog4jAutoInitializationDisabled context parameter to true. Disable scanning of log4j-web using <absolute-ordering /> in your web.xml. 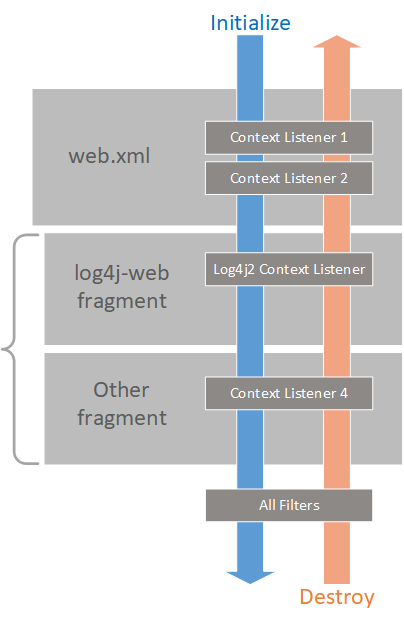 Move any listeners that use logging out of your web.xml and into fragments. The log4j-web fragment is configured to order itself before all other fragments so this will load your listeners in the correct order. I no longer have to worry about Wordpress/PHP security vulnerabilities and upgrades. The site loads a bit faster. Since a static site doesn’t require any server-side scripting I have more hosting flexibility. The layout and style are easier for me to edit since they’re just a few template files written in Markdown / Liquid. The current theme is Hyde with a some customizations. I’m working on a few more improvements to add category/tag support and comments in the near future.